For Gosschalks’ Development Director Steve Savage, the strategic value of Peppermint was neatly illustrated when one of the law firm’s largest clients presented a seemingly impossible challenge to their Licensing team. The client, a major nationwide retailer, decided in mid-October to extend the opening hours at 420 of its stores until midnight on Christmas Eve. This required varying the hours of the Premises Licence at each store to match the required opening hours. Given the timing of the instruction this gave very little time to prepare, process and submit so many applications given that the minimum time a single licence application can be determined by the Licensing Authorities after receipt is 28 days. “I first became aware of the challenge when Clare Johnson, our Head of Licensing, came in to my room looking for inspiration wondering how on earth we would manage it alongside our existing workload. My initial reaction was that it wasn’t possible and would be too risky to take on for such an important client,” Steve Savage recalls. “Ideally we’d have liked a good six months to prepare and deal with so many applications, even with our whole Licensing team working at full stretch, as it is already a busy department. We were faced with the prospect of involving other law firms to assist. Even then, the task still looked daunting. Between 4pm and 1am, based on his brief, Savage built a solution within Peppermint to automate and track the key stages of the licence variation process. He used a custom built dialogue process in Peppermint to generate the 420 matter records. At the same time, a newly created workflow process produced a checklist based on a custom built entity record to track each application through each key stage in the process to provide instant visibility on the progress of each application and the overall state of play. By the next morning, with the assistance of his template developer, he had everything the Licensing team needed, with custom templates for letters and forms, automated and populated directly from the Peppermint database. The solution was signed off by the Head of Licensing and the Licensing team were all trained by 10am. With 420 application letters and forms, each sent to nine responsible authorities by recorded delivery, there was a minimum of 3780 documents generated which required tracking to confirm delivery. Gosschalks’ Admin team were able to assist with this process due to everything being neatly contained within the same solution. In addition to the application documents, newspaper advertisements displaying the details of each application had to be arranged and coordinated along with laminated notices displayed outside each store alerting the public to the application. In total, more than 8000 documents were generated during the project. Gosschalks’ Licensing team used Peppermint to automate, manage, track and report on every step in the process. They published charts, views and reports directly to a custom built dashboard to provide both the firm and its client with an instant and current view of the status of every application and useful statistics on daily production. As a result of the technology developed and deployed so rapidly, the entire process, spanning 420 stores, was completed successfully in just 15 working days. 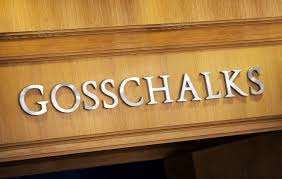 This is testament not only to the technology but also to the skill and dedication of the staff involved from Gosschalks’ Licensing team, who still handled their existing workload during that time. “It took us just nine hours to build the system within Peppermint,” Savage says. “Once we went live, our Licensing team were able to efficiently process applications with speed and confidence whilst our head of Licensing could get an instant view through the dashboard to track the progress on all and any application and could run instant reports for the client to keep them fully in the loop on our progress. technology to introduce real added value to the legal advice and services we already provide. Gosschalks is recognised as one of the leading licensing practices in the UK with a track record of delivering innovative technology solutions to assist its clients. It has extensive experience in building bespoke automated systems for individual clients. Before Peppermint, some of these solutions were costly and cumbersome, often taking weeks or months to develop and thousands of pounds in the process. “Peppermint has the potential to be truly transformational for our business and we are seeing evidence month after month to support that claim,” Savage says. Savage sees a common thread between Gosschalks and other Peppermint customers around the country. “We’re all innovators with great vision – we’re quite an entrepreneurial bunch and we all collaborate to learn from each other. “Within such firms, the decision to invest in Peppermint as a modern day all-encompassing Practice Management System is driven not only by senior lawyers but by technologists who work closely with their colleagues and understand their practices inside out,” he says, “where such decisions used to be driven by accountants who viewed such software as a glorified accounts system. Collaboration with other Peppermint users is very important to Gosschalks, Savage says. Instead of seeing a conflict of interest in sharing ideas and experiences with competing law firms, he sees an upside to collaboration. Gosschalks went live with Peppermint in March 2015. “After a very busy migration weekend we welcomed everyone back in on the Monday morning. Of course, after such a major change, it wasn’t all plain sailing at first for some but we comfortably managed a full week’s work and went home without any major dramas,” Savage recalls. He admits that was the result of a very carefully worked out and managed process. It was the single biggest change management project the firm had ever done, completed just six months after signing the contract. Gosschalks was moving from a complex and difficult-to-integrate solution comprising many different applications, to Peppermint’s single, end-to-end solution. Done badly, it could have been extremely disruptive. It went smoothly because of the change management process covering all aspects of training and data migrations. Gosschalks recently moved to Peppermint’s Pulsant cloud platform.